A parliamentary report of 1777 recorded parish workhouses in operation at Biddenden (with accommodation for up to 52 inmates), Rolvenden (50), Stone (20), and Wittersham (20). A parish workhouse, now two cottages, was located on The Street in Stone. Stone former parish workhouse, 2005. 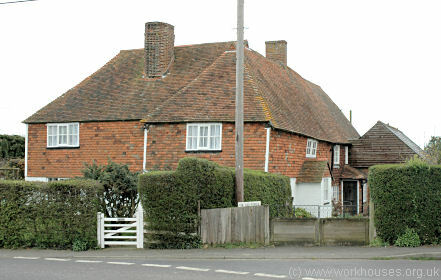 In Wittersham, what was originally the mill-house of the Stocks windmill later became the parish poorhouse. 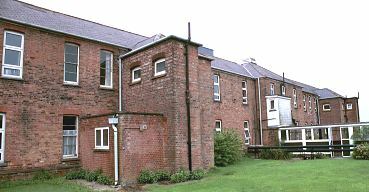 Wittersham former parish workhouse, 2005. Kent: Appledore, Biddenden, High Halden, Kenardington, Newenden, Old Ebony, Rolvenden, Stone-Next-Tenterden, Tenterden, Wittersham, Woodchurch. The population falling within the Union at the 1831 census had been 10,478 with parishes ranging in size from Old Ebony (population 59) to Tenterden itself (3,177). The average annual poor-rate expenditure for the period 1833-35 had been £12,511 or £1.3s.11d. per head. Initially, the Tenterden Union continued to use an existing workhouse and in 1836 the Poor Law Commissioners authorised an expenditure of £1,100 on its enlargement. 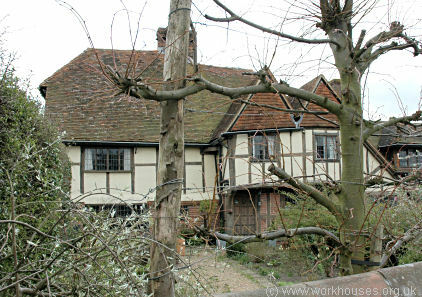 However, in 1843 an new building was erected at a site to the west of Tenterden. The architect was James Savage, who was also responsible for the workhouse at Bromley. The location and layout of the Tenterden workhouse are shown on the 1908 map below. The main building, which faces to the east, has a T-shaped plan. Its central section is of three storeys with two-storey wings and three storey cross-wings at each end. Tenterden main block from the south-east, 2001. At the rear of the main building is a central semi-hub leading to the dining-hall block. Tenterden rear of main block and dining hall from the south, 2001. To the west of the site the two-storey workhouse infirmary. Tenterden infirmary block from the south-east, 2001. The workhouse later became West View Hospital providing geriatric care. The buildings were demolished in around 2002. Kent History and Library Centre, James Whatman Way, Maidstone, Kent ME14 1LQ Holdings include: Guardians' minutes (1867-1930); Admissions and discharges (1912-23); Births (1866-1929); Deaths (1866-1939); Creed registers (1901-31); etc.